Since making his film debut more than 20 years ago, Robert Downey Jr. has consistently been called one of the finest actors of his generation. After being sidelined with personal problems, he once again is focusing on his career. His latest film is the thriller "Gothika," costarring Halle Berry. "Gothika" is one of two Downey films to open this season. The actor stopped by The Early Show to talk about the film and his turbulent past and path to recovery, including his recent engagement. In the film, Downey is in love with the boss' wife. He explains, "He kind of has a crush on his coworker, and their boss is her husband, and then when he's killed, it just becomes kind of complicated. Talk about conflict of interests." One of the scenes called for a struggle and Berry ended up being hurt. Downey tells The Early Show co-anchor Rene Syler how it all happened. "We were struggling in the scene," Downey says, "She's so strong, and she gets really into the physical action, so she had been beating myself and several other orderlies up for a couple of days during the scene and, I had to pin her down on a cot. And I had to restrain her arm, and she was resisting, and when I did, I felt her arm break. See you in a month." Downey noted, "I still make mistakes." Speaking of mistakes, he spoke about his addiction problems. Downey says he has been sober for a couple of years now, and he no longer struggles. He says, "You just have to be mindful. But it's not like I was having a bunch of fun, when the repercussions were getting really serious." The lesson he learned from the experience is to move on. "After a bunch of times, you have to make a decision of either, 'I regret everything' or I'm going to kind of just say, 'all right, time starts now'," Downey explains, "Because, otherwise, I think this being tied to the past and this being perpetually in the toxic guilt, there is no way you can't return to drug abuse in that way. I see it, too. People are like, 'all right, I messed up and I relapsed and now I feel really bad and I have to face the music and now I feel resentful to have to face the music so maybe just a couple of drinks,' you know? So you just got to get out of the whole game. It's not that difficult." Now that he is out of it, he has plans to marry "Susan Levin, soon to be Mrs. Downey," he says. That is not all, he says, "There is a lot of things you can't do when you're busy and in a drug dependency. I love writing and I'm a musician. I'll probably have advanced a couple of levels in my martial arts training, which also has been really helpful. And my kid will be 11, I'll be 39 and I'd like to go on some adventure with him and go somewhere and have fun. It's all about the kids." His son, Indio comes from his union with ex-wife Deborah Falconer. Asked if he wants to have more kids, Downey says, "A bunch." Got his breakthrough role in "Less Than Zero" as the tragic, cocaine-addicted Julian in 1987. Worked opposite James Woods in "True Believer" as the idealistic lawyer in 1989. The same year, he was the confused romantic hero in "Chances Are." Got the title role in Richard Attenborough's biopic "Chaplin" in 1992. The film was not well received at the box-office, but his performance earned him a Best Actor Oscar nomination. Co-starred with Charles Grodin and Kyra Sedgwick in the comedy "Heart and Souls" in 1993. Also on that year, he was cast in Robert Altman's "Short Cuts." Received critical acclaim in Oliver Stone's "Natural Born Killers" in 1994, as an Australian talk-show host broadcasting during a prison riot. And went on to perform as Marisa Tomei's would-be lover in "Only You." Had three high profile roles in 1995: Holly Hunter's manic gay brother in Jodie Foster's "Home for the Holidays;" as a 17th-century court physician who falls out of favor with the King and seeks redemption in a Quaker hospital in the lavish "Restoration;" and as Annette Bening's brother in Richard Loncraine's "Richard III", starring Ian McKellen. Was arrested in 1996 for drug possession and carrying an unloaded firearm. He continued to work while going in and out of rehab as part of a sentence of three years' probation. After missing mandatory drug tests, he was re-arrested and jailed in 1997. Two years later, after repeated offenses, Downey was sentenced to a prison term, despite outcries and pleas that the actor be placed in rehab. The same year, he was seen in "One Night Stand," as a gay man stricken with AIDS. Worked as an associate of Kenneth Branagh's Southern lawyer in Robert Altman's "The Gingerbread Man" in 1998. He was also a womanizer confronted by a pair of his lovers in "Two Girls and a Guy." Landed the role of a documentary filmmaker's homosexual husband who makes a pass at Mike Tyson in "Black & White" in 1999. And in 2000 offered a slyly comic supporting turn as Michael Douglas' gay editor in "Wonder Boys." Released from prison in August 2000 after being incarcerated for a year. Soon after, he entered a drug treatment facility. The next role he played was love interest to Calista Flockhart's titular "Ally McBeal" on that Fox TV series, for which he got great reviews. But during the Thanksgiving holidays in 2000, he was arrested on weapons and drug possession charges but cooperated with police. Two months later, he picked up a Golden Globe Award for his work on the Fox show. Was once again arrested in April 2001, for being under the influence of a controlled substance. Producer David E. Kelley summarily fired him and re-wrote the series' last episode (in which his character was supposed to marry Ally). Despite earning an Emmy nomination for his work on the show, there was little chance of his ever returning to reprise the part. 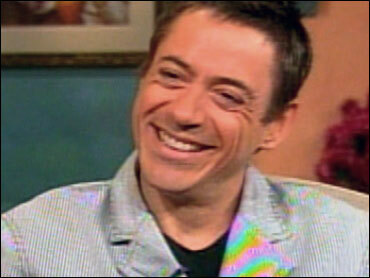 In July 2001, Downey was sentenced to three years probation, including one year in a drug rehab center.